In 1981, the German novelist and screenwriter, Patrick Süskind had his breakthrough with the play Der Kontrabaß (The Double Bass), which was originally conceived as a radio play. In it the only role is a tragi-comical orchestral musician, who has so many problems with his instrument (the double bass) and his insignificance (in the orchestra) that he falls into nagging fatalism. 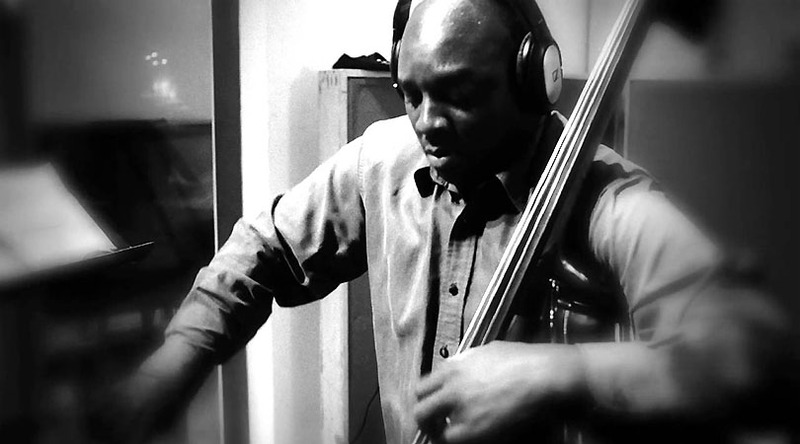 Although this was pure fiction, there is ample anecdotal evidence to suggest that bassists across the musical spectrum—despite enjoying much success—may have felt their roles were restricted to “anchoring” the rhythm section until Jimmy Blanton broke free, paving the way for bassists from Oscar Pettiford and Ray Brown, to the great Charles Mingus to harmonize and invent melodically. 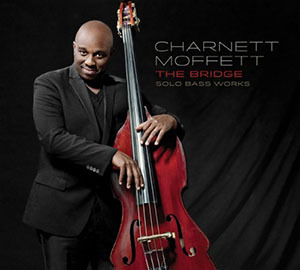 And now there is this: a truly remarkable solo adventure by the young and ingenious bassist, Charnett Moffett, The Bridge: Solo Bass Works. Solo bass records are rare and this one also makes its journey in a rarefied realm. There is a visceral energy that propels the music of this record. It appears to come from Mr. Moffett’s African American-ness. The palette of a myriad colours and textures that is attendant with this cultural anthropology is unique to the music. Indeed as Mr. Moffett approaches the topography across the soundscape of his idiom—the idiom of jazz—he expresses music with a radical thrust, recalling as much the righteous obstinacy of Rosa Parks and Dr. Martin Luther King, as the clenched fists of John Carlos and Tommie Smith. Here he is a kindred spirit of Charles Mingus and this is expressed with eminent beauty in the music of “Black Codes (From the Underground),” Mr. Mingus’ own “Haitian Fight Song” and Mr. Moffett’s “Kalengo”. His interpretation of and approach to the high art of gospel is clear from the abject lamentations in the song “Joshua Fought the Battle of Jericho/Rolling in the Deep”. His strident pizzicato is deeply guttural and focussed on the majesty of the bass is revealed as few musicians are capable of doing. Clearly Charnett Moffett has paid his dues, both spiritually as well as temporally. But there is something else in evidence here. Charnett Moffett has revealed himself to be a musician and bassist possessed of the high art of intonation and elegantly perfect pitch. Gone are the flurry of quarter tones and root notes; Mr. Moffett’s phrases and lines dance around the melody with brazen growl and grizzled bass-baritone voices. His fingers dance on the neck of his bull and on the strings, evoking arias of immense beauty. His playing may be fast, at times, but it is never rushed. Mr. Moffett always has a handle on pulse and tempi and even when he pushes both, accelerating both, just a tad, he ensures that the intonation and dynamics are always preserved so that the expression and soaring voices remain front and centre. His medley of Thelonious Monk songs are a fine example of this and his approach to his music as if it was a continuous musical aria can be heard on several songs listed here, especially: “Bow Song,” “The Bridge: (Solo Bass Works)” and in the incomparable version of “All Blues,” which is followed by a definitive bass etude: “Free your Mind”—a breathtaking that highlights Mr. Moffett’s ingenious handling of playing con arco, his instinctual feeling for his instrument, his virtuosity and technical capability. The contrabass is that kind of instrument that can be overpowering because of its range and depth of its frequency response, but Charnett Moffett’s instrument soars way above the troughs carrying the instrument’s gravitas with it. His playing is elegant in an operatic manner. And it is so ahead of its time that it appears to be trashing its way to the musical undergrowth that seems to have grown its way into the recorded and performing stages. Recently Mr. Moffett challenged listeners to stretch their imaginations with him as he held centre stage at the 2013 Monterey Jazz Festival in a solo set that lasted 15 minutes or so and in the heart and mind, seemingly forever. With this record, Mr. Moffett does the same: He dares listeners to give the mind wings and take flight with him in a set that is elevating and edifying so much so that it fills the soul with a joy that knows no bounds. This is a record that must rank with some of the very best recorded music in that proverbial, timeless manner. Track Listing: Caravan; Eleanor Rigby; Black Codes (From The Underground); Fragile; Haitian Fight Song; Kalengo; Bow Song; Joshua Fought The Battle Of Jericho/Rolling In The Deep; Skip Hop; The Slump; Monk Medley; Oversun; Swinging Etude; Walk Spirit, Talk Spirit; Truth; The Bridge (Solo Bass Works); Nature Boy; Things Ain’t What They Used To Be; All Blues; Free Your Mind.